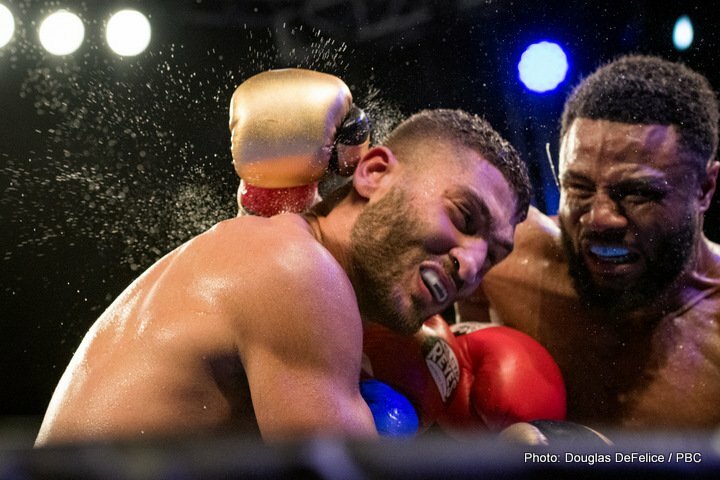 Friday, December 8, 2017, a young talented prospect was out-boxed by a world-class veteran of the sport as Ahmed Elibiali (16-1-0, 13 KOs) fell to Jean Pascal (32-5-1, 19 KOs) in the sixth round of a scheduled ten-round bout at the Hialeah Park Casino in Hialeah, FL. The event was televised on FS1. Elbiali, an Egyptian-born Miami local, entered the ring wearing blue shorts with white trim and red gloves. Pascal, a Haitian-born Canadian resident, fought in all black trunks and shiny gold boxing gloves. Both fighters were received warmly by the South Florida audience and touched gloves professionally. 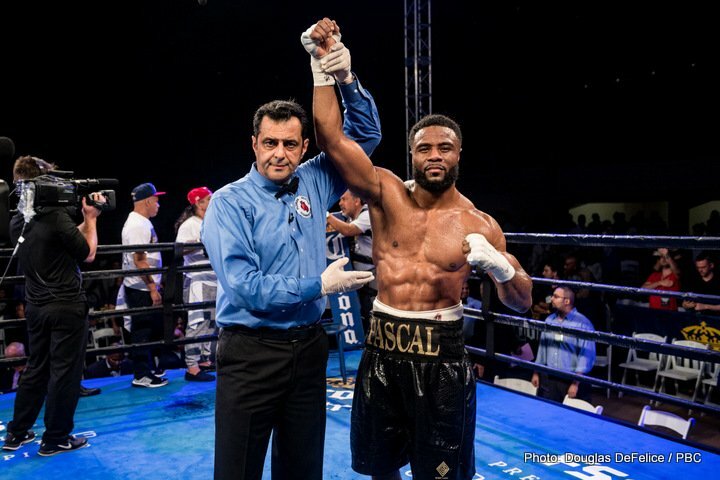 In the opening minute of the bout, Elbiali appeared to stun the Haitian former world champion after avoiding Pascals punches and counterpunching Pascal with heavy blows. But the crafty veteran held on, regained his composure, and took over the fight. Throughout the bout, Elbiali appeared unable to deflect or defuse Pascal’s lead overhand right which would prove increasingly problematic. By the sixth round, Pascal had frustrated Elbiali, and that frustration was visible in the Egyptian’s eyes. Indeed, at 0:52 of the sixth round, Pascal landed several power punches in consecutive, short fashion. The punches landed clean, hard, and directly to Elbiali’s skull. Elbiali did not return fire. As Pascal geared up for another offensive, referee Telis Assimenios smartly stepped in and waived his hands about. That instant marked the end of the bout, the end of Elbiali’s undefeated record, and the end of Jean Pascal’s impressive career. TKO 6. The undersigned writer has covered Elbiali in Hialeah, FL in the past. In May, 2014, Elbiali appeared in an untelevised undercard against Steven Chadwick Jr. Within the confines of the first round, Elbiali had left his opponent motionless, face-down in the ring where Hialeah Fire Rescue would remove the man in a stretcher. The undersigned writer described the then-unknown local as “the fighter who left the biggest impression” that evening. Three years later, Elbiali returned to the same venue as the televised main event. Jean Pascal, a former WBC Light-Heavyweight Champion, is a Haitian-born fighter who resides in Laval, Quebec, Canada. He took the WBC Light-Heavyweight belt from Romanian-born, fellow Quebec resident Adrian Diaconu in 2009 and defended that title successfully in a rematch later the same year. After successfully defending his title against “Bad” Chad Dawson, Pascal ultimately dropped that title to Bernard Hopkins in 2011. Later, Pascal would lose twice in two years to Sergey Kovalev in 2015 and 2016. Elbiali has multiple paths to choose from following the bout. He is young, talented, and has knockout power. Accordingly, there is every reason to believe that the Egyptian knockout artist will be back in the gym, back in the ring, and back on the television. While tarnishing his once-perfect record, Elbiali also showed that he can take heavy punches and displayed a willingness to step into the ring with a world class fighter like Pascal. Impressively, he has made time in his career to secure a bachelor’s degree from Florida International University and is currently in graduate studies at NOVA Southeastern. Prior to the bout, Pascal announced to international media that this would be his last fight, and he confirmed as much after the stoppage. For Pascal, December 8, 2017 marks an explosive end to an impressive career in boxing.